Drain pineapple, reserving syrup. Add water to syrup to make 1 1/2 cups liquid, heat to boiling. Stir in lemon-flavored gelatin till dissolved. Chill till partially set; pour 1/2 cup in bottom of a 6 cup ring mold. 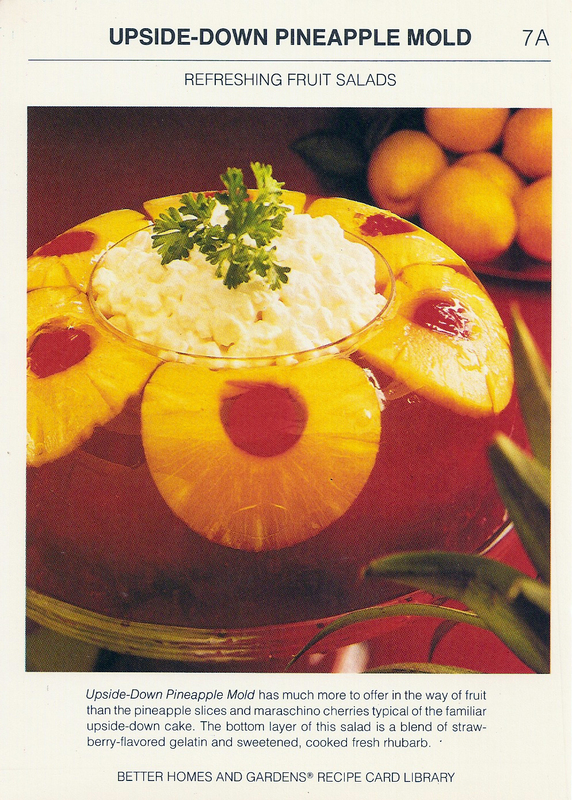 Arranged pineapple slices over gelatin, placing a cherry in center of each slice. Pour in remaining lemon gelatin. Chill till almost set. Meanwhile, in saucepan combine rhubarb, sugar, and 1/2 cup water. Cover and cook about 5 minutes or just until rhubarb is tender. Drain rhubarb thoroughly, reserving syrup. Add enough water to rhubarb syrup to make 1 1/2 cups liquid. Heat liquid to boiling. Stir in lemon juice and strawberry-flavored gelatin till dissolved. Chill till partially set; fold in reserved rhubarb. Pour ove lemon-pineapple layer in mold. Chill till firm. Unmold onto salad greens. If desired, place a bowl of cottage cheese in the center of the unmolded salad ring; trim with parsley. Drain pears, reserving 1/2 cup of the syrup. Dissolve lime-flavored gelatin in 1 cup boiling water; stir in reserved pear syrup. Chill till partially set. Add yogurt; beat till smooth. Chop pear halves; fold into gelatin. Pour into 9x5x3-inch loaf pan. Chill till firm. Cut in rectangles to serve. Makes 6 servings. ©Meredith Corporation, MCMLXXVIII. All Rights Reserved. Printed in U.S.A.